We have been following your recommended eating plan (whole foods, checking for food sensitivities to gluten and dairy). After a week or so, my husband started itching like crazy. No rash just itching. Any suggestions as to what it might be from? Congratulations on changing the family’s diet! When I hear itchy skin – I think of essential fatty acids. How much fish is being eaten per week. Are you taking 2-3 tsp of Carlson’s Cod Liver Oil per day? Is there any unusual food that has been eaten now compared to before? I know that you are checking for food sensitivities by eliminating gluten and dairy for three weeks. Are you all 100% gluten-free? It’s funny how much you find out when you ask questions! It appears that my husband has not been 100% faithful on the gluten free end of the spectrum. He ate some chicken nuggets from Wendy’s on Tuesday and the itching started on Wednesday night. Eating the “clean” whole food diet allows the body to detox and quiet down. By pulling out offending chemicals and substances, the healing begins. Inflammation inside of you quiets down little by little. The inflammatory chemicals reduce. You start to feel good as your cells slowly get the nutrients they need. Your cells function better and happy cells make healthy tissues and organs. If gluten is a problem, eating gluten after a week or two of being gluten-free could cause the inflammation to flare up and a cascade of effects – different for each person – would be apparent in the cleaner, healing body. Maybe it is the gluten or maybe it is the junkie chicken nuggets and not the gluten. What kind of sauce did he dip them in? Did he eat the fries? A whole can of worms has been opened up! 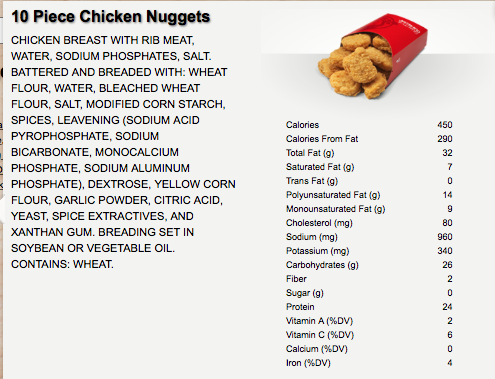 The Spicy Chicken Nuggets have Dimethylpolysiloxane. Dimethylpolysiloxane is used to make Silly Putty and silicone caulk. The cheapest ingredients are probably used so I suspect that genetically modified corn and soy foods snuck into this caulk-like chicken as well since 91% of all soy and 85% of all corn is GMO. The sauce ingredients deserve their own rant. Here’s the laboratory concocted Honey Mustard Dipping Sauce. A 2007 study published in Lancet showed that sodium benzoate can cause hyperactivity in kids. Coat those chemicals with a little high fructose syrup and now you really have a fun afternoon ahead of you! 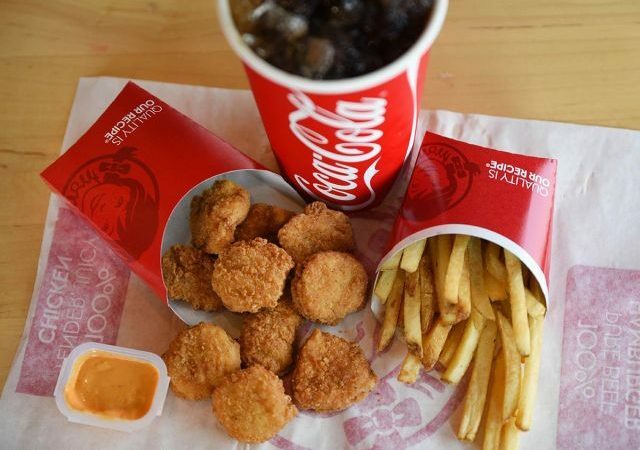 The 10 piece nuggets with the honey mustard sauce contains enough carbs to give you about 10 tsp of sugar. Which makes me think, what was this washed down with? If the nuggets were eaten with an order of medium fries, medium Coke and 2 packets of ketchup – hold your hats – another 38 tsp of sugar has been consumed. Add that to the 10 tsp from the nuggets and sauce and the total is 48 tsp (or 1 cup) of sugar. 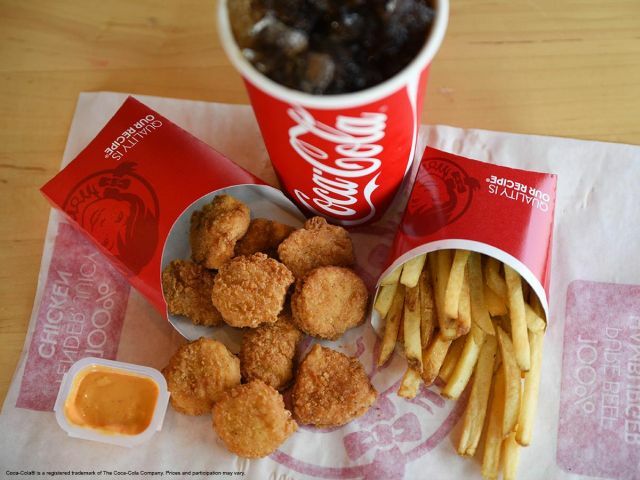 Who can go to Wendy’s without ordering a Frosty? A large Frosty is 96 grams of carbs, or 24 tsp of sugar. 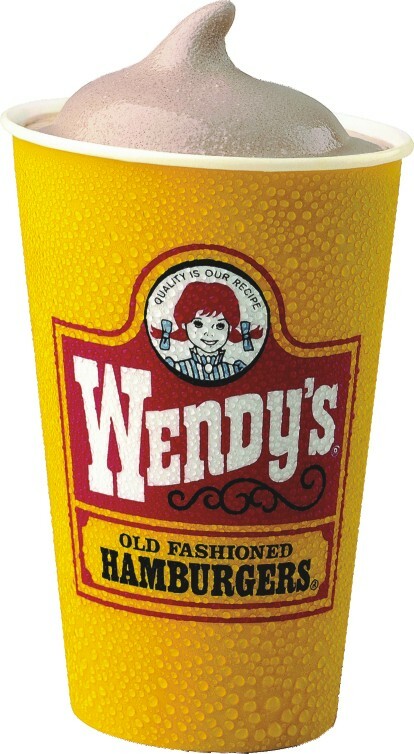 1 1/2 cups of sugar for this lunch from Wendy’s. Fast Food will kill you, or at least make you itchy and hyper. So, thank you, Anonymous, for your question. I’m sure that your hubby just had the plain nuggets and water. Note: I wasn’t really mean to the reader, I just jazzed up my answer for this newsletter to make my ratings go up. All true. Look it up.